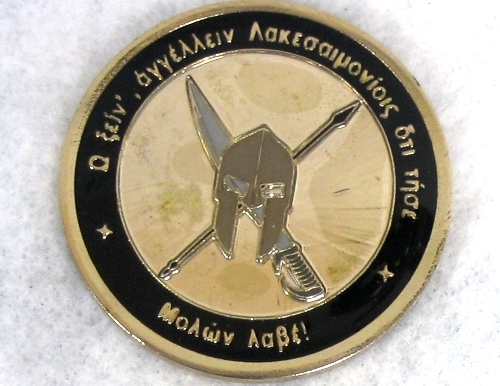 An exclusively made Spartan Challenge coin commemorating the famous Battle of Thermopylae. The Battle of Thermopylae was fought between an alliance of Greek city-states, led by Sparta, and the Persian Empire of Xerxes during the second Persian invasion of Greece. It took place in August or September 480 BC, at the pass of Thermopylae ('The Hot Gates'). Xerxes had amassed a huge army and navy, and set out to conquer all of Greece. The Athenian general Themistocles had proposed that the Allied Greeks block the advance of the Persian army at the pass of Thermopylae, and simultaneously block the Persian navy at the Straits of Artemisium. After the second day of battle, a local resident named Ephialtes betrayed the Greeks by revealing a small path that led behind the Greek lines. Aware that his force was being outflanked, Leonidas dismissed the bulk of the Greek army, and remained to guard the rear with 300 Spartans, 700 Thespians, 400 Thebans and perhaps a few hundred others, the vast majority of whom were killed. 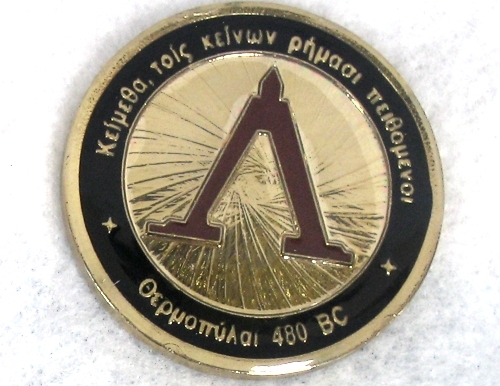 The coin bears the inscription"Thermopylae 480 BC" and "Molon Lave!" in ancient Greek (="Come and get them! "), the famous answer that King Leonidas gave to Xerxes when he demanded that the Greeks surrended their arms. It also bears the famous epitaph inscription by Simonides at the burial mound of the Spartans in Thermoplyae. The inscription reads: "Go tell the Spartans, stranger passing by, that here obedient to their laws we lie." Special price includes free shipping!